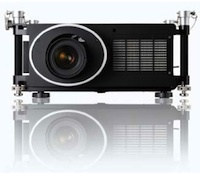 NEC Display Solutions of America has unveiled a new high-resolution, high-light-output digital projector designed for education. The NEC PH1400U offers a WUXGA resolution and a brightness of 13,500 lumens. The PH1400U, which debuted at the InfoComm 2013 conference taking place this week in Orlando, FL, is powered by a unique three-chip 0.96-inch DLP system and offers 14,000 center screen lumens (13,500 ANSI lumens), 2,000:1 contrast ratio, and WUXGA (1,920 x 1,200) native resolution in a compact form factor. Pixel-based, motion-adaptive de-interlacing to remove undesirable motion artifacts. The projector features a wide variety of input ports, including HDMI with HDCP, DisplayPort, three computer inputs, component and S-Video, and stereoscopic 3D through the DVI dual link input. According to the company, the PH1400U can operate 24/7 and is designed for venues with high ambient light and the need for a large screen size. The PH1400U will be available in June for $59,999 (without lens). Education customers receive an additional year of warranty, and Star Student customers receive an additional two years. NEC also introduced the NP-PA602U, the company's first projector powered by the Valens HDBaseT chipset, which enables transmission of uncompressed high-definition video at distances of up to 100 meters over a single CAT5/5e cable. "The HDBaseT technology can reduce the hours, even days, previously required to run bundles of cables to and from multiple projectors," said Richard McPherson, senior product manager of projectors at NEC Display Solutions, in a prepared statement. The NP-PA602U offers 6,000 lumens, WQXGA (3,840 by 2,160) native resolution, HDMI in/out, and DisplayPort connectivity. Further information about the PH1400U and NP-PA602U can be found at NEC's site.